I am officially done needing this line. I have bred them where I need them. So I will not be pairing them up again. I will just be breeding their Cama/SD DA cross children at this point and making that more Cama blood. I don't need to keep breeding them to my rats forever. I was going to keep a pure line of them going but I am no longer needing it. - Also an update, the man who developed the line at the lab as given us the thumbs up on the genes in the DA line they are clean, (as I asked for more info). So he thinks breeding the way I did was just perfect! YAY! I will keep this page up as a reference for all my past work. This is my only line of standard eared rats. They are an out cross to bring healthy blood into my dumbos. They were bred from 6 Harlan Sprague Dawley females and 3 male Harlan Dark Agouti males. The lab tek kept 6 groups of these rats. All were inbred for 40 generations that was group 1. They were then out crossed after the 40th gen, to another one of the 6 lines and I am now dealing with the 19th+ generation of the 2nd group. This introduced a new color into the rat community as we never had the Dark Agouti before. And we didn't know we were getting a different color until we bred them to our lines. Those are only at Isbn and my rattery at this time. No one else in the U.S has them to our knowledge. Let me add that I am not hook line and sinker accepting this blood and breeding it right into my lines. I am keeping them separate to evaluate them. I am in the testing phase. If you want standard eared babies you will be getting albino, black or Dark Agouti babies that are the children to the rats listed here. Almost always the albinos will be what I offer you though as I prefer to adopt out the pink eyed and keep the black or Agouti. I do not have any other standard eared rats to offer. The SD: This is an out cross line that I am going to be working with starting in 2012. They have been genetically engineered in a laboratory. I got them from my close friend Terren at Isbn Rattery who I am mentoring. The rats have had their genes mapped and documented since 1925 by the Harlan laboratory. On the SD side. This particular line is bred for longevity data and has an almost completely tumor free rate. This is a longer live expectancy than the pure SD lab line. They have pedigrees that date back to 1925 which is around 1100 generations if I am counting right. Sprague Dawley® Rats are bred and known for their docile temperaments and ease of breed ability. They have big litters of very sweet babies. The DA: The Dark Agouti are not found in the pet community in the US at all unless they are out of Isbn or Cama lines from this family. Inbred by Odell, Oak Ridge National Laboratory, Tennessee, from heterogeneous stocks with unknown antecedents. To Wilson at Wistar Institute, who named it DA because it expressed the ?d? blood group allele, and it is a (agouti) in color (Wilson, 1965). Palm and Black (1971) suggested that it might be related to COP, even though they differ in coat color. To Agricultural Research Centre, Cambridge. They also have been gene mapped and have pedigrees dating back to the origin of the line. These are almost black they are so dark and rich colored. Both lines which are obviously now bred together as one line, came with the paperwork containing all of their genetics and history. This line has no genetic tumors or health problems present in the lines at all, as we all know spontaneous tumors are not out of the question with any rat, but very rare in the history of these rats. That is a lot more than you can say for any other pet rat line. Pet rat breeders cannot track anything in their genetics like scientist do. However that's exactly what I have with this line. This gives me the confidence that I need to be able to trust them. They will be bred to mine to clean them of any negative traits. 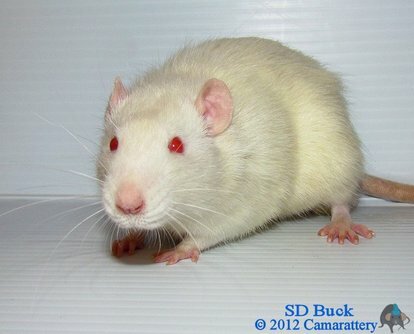 However Camarattery bred rats also have the reputation for being tumor free and very healthy. This is of course not a main stream way that a rattery breeds. You never see this. However, the benefits of improving the health of pet lines without ruining temperament is paramount. I plan to always keep a clean inbred line of these SD rats going so that their genetics never change from the original paperwork on them. The lab was able to tell Isbn how they need to be bred in order to do that. Side note...Some breeders like to breed in pet shop lines or mill bred animals to out cross with, and this is their choice. However I thought breeding tested, mapped, very well known rats was a better option for me. Less testing will need to be done to determine health! Its already been done for me! Update: 11/16/2012 New info from the Isbn via the lab tek who developed the line.. The original group was 3 DA males and 6 SD females. The first group was inbreed for 20 generations and then the rats he is breeding to use for the study will include that group at 40 gen and the current group at 20 gen. Why, I have no idea. It has to do with his paper. The data on average life span and mean life span is from the first group of rats. It is looking like the average life span though is improving. They are Harlan DA and the gene for the bile ducts was bred out by the 6th gen of the previous group.They bred them all as PEW so there wouldn't be any preferential treatment once it gets to testing phase. But this line lives an average of 36 months. The tek who developed the line 1st bred them at the lab at NJH Hospital and once he got his grant he took them to the school where they are now. FYI...SD rats are hooded which is my specialty. The dark Agouti bred Berkshire into them. So that compliments my self's. And they are PEW. One of my very favorite colors! Also because Harlan patents their lines we cannot use those names. So well call them Dark Agouti in the fancy. It isn't correct to just call them "Agouti" because they aren't the same thing. Thank you Terren! See that's the way to treat your mentor! - My personal notes: I got them on 4/21/2012. The SD's seem to be very cheerful, happy & playful little guys. They seem like a mixture of Sprague Dawley and frogs because they "boing" so much. So I am affectionately calling them "Sprawgies." They are very energetic, more so than my laid back dumbo lines! They integrated really well into my colony with absoloutley no problems. There were no scuffles at all. My rats were very happy to see them, clean them and kiss them. Their heads are just a little bit longer than what I am used to, but their bodies are of nice type, and very normal tail diameters. Their ears are really thick like leathers, and seem of nice type. They look very pretty and I don't see any traits I wouldn't want to see integrated into my lines. Other than the pink eyes. As I like no dilutions. But the benefits will be many. Every time I breed an SD to my line, that makes mine 50% cleaner... I will integrate them into my lines slowly as I always do. As I am skeptical of everything, being burned by breeder bred rats so many times. 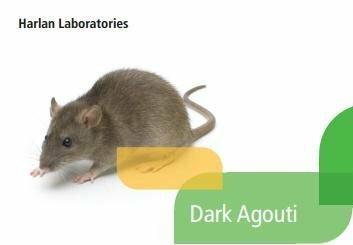 All related Dark Agouti line traits such as defective bile acid transport on does were bred out by generation 6 according to lab data from National Jewish Respiratory Health Hospital. Breeding the SD to Dark agouti caused an increase in life expectancy and docile temperaments. Even over the already docile SD. As per Harlan's PDF, the dark Agouti have "extremely docile temperaments".